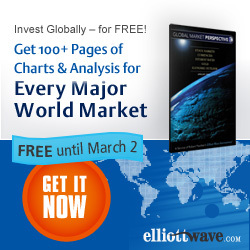 Once each year or so, our friends at Elliott Wave International do something unheard-of in the world of financial analysis - they give it away for free! Get this 120-page Global Market Analysis free for a limited time! * PLUS, the 120-page book includes analysis culled straight from EWI's professional-grade Specialty Services, each of which is valued at $199/month. This is truly a very rare occasion, and it only lasts for just a few more days. Whether you use Elliott or not, we highly recommend you stop by the webpage and take advantage of this limited-time, completely free offer.Learn how to get your free 120 pages of global analysis here.